If you’re black and blue after a mountain bike fall or have taken a beating during training, your sore muscles will probably recover faster if you take a grape seed extract supplement. We base this suggestion on the results of an animal study that researchers at Stellenbosch University in South Africa published in Medicine & Science in Sports & Exercise. Muscle tissue damage – as a result of heavy training or from taking blows or a fall – results in inflammatory reactions in the body. Plant-based compounds such as proanthocyanidolic oligomers in grape seed extract inhibit inflammation. Extrapolation: plant-based compounds such as proanthocyanidolic oligomers speed up the recovery of damaged muscles. Nice theory, but does it work in practice? This is the question the South Africans set out to answer by doing an experiment in which they anaesthetised male rats and then caused muscle bruising by dropping a weight on their hind legs. For a period of 14 days they gave one group of rats a placebo every day [Pl-PLA] and another group 20 mg grape seed extract per kg bodyweight daily [Pl-PCO]. The researchers used Oxiprovin, a grape seed extract made by the South African company Brenn-O-Kem, which consists of 45 percent proanthocyanidolic oligomers. The human equivalent of the dose they used would be 140 mg per kg per day. The supplement was given orally. 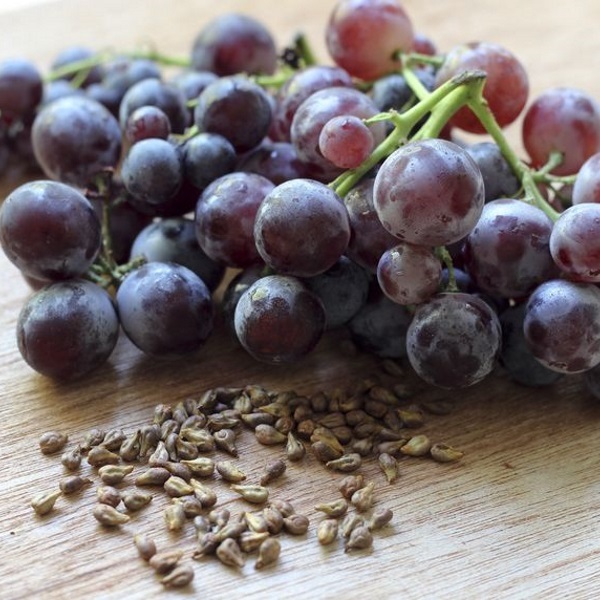 In the rats that had been given grape seed extract there was a faster decrease in the amount of inflammatory proteins such as IL-1-beta and TNF-alpha in their blood. The grape seed extract boosted the production of foetal myosin heavy chain in the damage muscle tissue. Foetal myosin heavy chain is an indicator of muscle fibre recovery. The figure above shows how grape seed extract speeds up muscle recovery. Macrophages, immune cells that clear up damaged cells that are beyond repair and then produce signalling substances to kick-start tissue regeneration, entered the muscle tissue more easily in animals that had been given grape seed extract. Fundamental research has shown that macrophages also play a key role in anabolic processes that arise after exceptional physical exertion. So might bodybuilders also benefit from grape seed extract? Med Sci Sports Exerc. 2012 May;44(5):872-80.